What did you do after graduating from Capilano University’s IDEA School of Design in 2009? After graduating I started a branding agency with a partner. After several years I was looking to do something different and shift the focus and purpose of what types of clients I was working with. You grew up in Kelowna, do you go back often? I go back to Kelowna once in a while to see my family, but not very often. What type of work were you doing in Vancouver? For eight years, I was creative director, designer and thought-leader at a Vancouver branding company. We worked with some exciting brands and it was an incredible learning experience. I did everything from branding to package design and websites, and the variety kept things fresh and exciting. After several years my vision for the types of businesses I wanted to work with was diverging. Although the company was quite successful, I still loved working in the field of design, and we had lots of on-going work, I had a deep passion to do something more and something with a richer purpose. I made a decision in late 2016 to leave the previous branding company I was partners at, move to Squamish and start something new. I took some time off, rode my mountain bike every day and had a much needed sabbatical to re-fill my creative juice stores. "Pursuing new and expanded adventures and branding companies who are ambitious and who aren’t afraid to get zesty"
Taking this break allowed me to slow down and get perspective on my life, my values, my passions and dreams. I started my new expanded adventure by creating a personal brand. 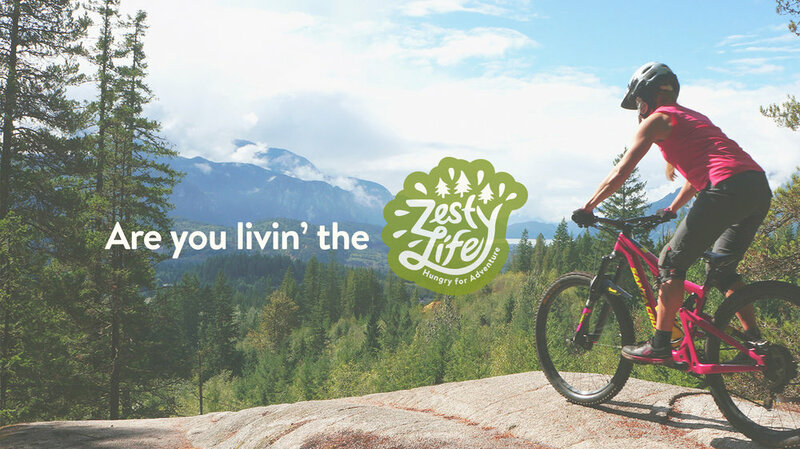 Zesty Life zestylife.ca was formed by combining all of my passions; creativity, sports, nutrition, health, creative writing and videography. It’s allowed me to expresses myself, share insights and help others find their passionate purpose through business and personal mentoring. This also became a natural segue to my new branding studio, Zesty Brands zestybrands.ca and a great way to introduce myself and gather new clients. Zesty means being lively, enthusiastic, spirited. This set of characteristics fit my personal brand and the types of future branding clients I wanted to work with. The purpose is more than just about making money, it’s about working with passionate brands who aren’t afraid to challenge the norm. I believe when you have the courage to get Zesty, that is when the magic happens—where truly amazing brands are born. These days I am working with a variety of businesses, but the common thread is those who are seeking radical differentiation. I began working with Tim and Anne Clifford at Mintstone several years ago, and we have a fantastic team energy when it comes to interactive design. They are hands-down the best kept secret for web development in the lower mainland. They can make any idea a reality and have a very unique custom WordPress methodology that’s unbeatable for clients. They are an invaluable part of the Zesty tribe. Part of what fuels my success is the way I’ve shaped my daily routine and how I work. I’ve always been a rebel, so naturally it looks nothing like your typical office gig! I usually wake up around 5am and centre myself with some yoga and a healthy breakfast. From there I will put in two–three hours of design work before taking a break mid-morning for a solo mountain bike ride with my dog Kula. The creative break allows me to nourish and rest my mind; this it vital to producing exceptional results and bringing passion and ideas to my clients. When I return to work, I am refreshed, more productive and rarely have the brain-fade that you often see later in the day if you were to sit at your computer from 9–5. Meetings with clients are often on-site and I typically use Basecamp, Harvest and WaveApps for daily client interaction, time-tracking and bookkeeping. I think it’s important to note that creativity doesn’t stop in the field of design. When you’re a creative thinker you have the ability to construct an incredible life for yourself, however you envision it. As long as you have the passion and drive to go along with it, there’s nothing you can’t do. Some of my memorable highlights from my time at IDEA School of Design were Kiff Holland’s painting classes, he was hilarious. Another great memory was our trip to New York, when I got the departure time wrong and nearly missed the flight! My advice for new students is to trust your gut, but know that your career is probably going to turn out totally different than you originally planned! Don’t be so hard on yourself either, it’s a learning experience and you’re not going to be perfect 100% of the time. The last tip would be to try and integrate YOUR uniqueness into whatever path you choose because that’s what’ll give you an x-factor. Right now I’m working on a variety of client projects, running my blog, putting on some wellness retreats in Squamish, writing an e-book and also in the process of launching my own health product which is all super exciting! You can follow Rachelle on Instagram @zestybrands.